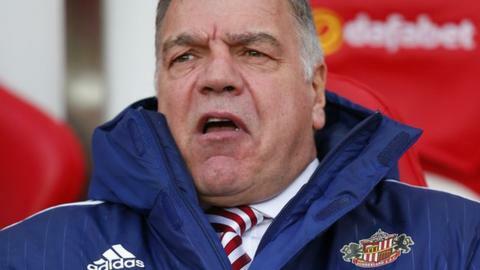 Sunderland boss Sam Allardyce has warned there could be no English managers in the Premier League "very shortly" if current trends continue. Only three of this season's 20 Premier League clubs now have English bosses. "We train our guys pretty well, we educate them very well, but they just need a chance," Allardyce told BBC Radio 5 live's Sportsweek. "It always goes to what seems a sexier version than we are. That is, a foreign coach, which I think is a great shame." Following the dismissals of Tim Sherwood and Steve McClaren at relegated Aston Villa and Newcastle respectively earlier in the season, plus Garry Monk at Swansea, Allardyce, Alan Pardew and Eddie Howe are the only current English managers in the top flight. "It is not just us three English and I think six British in total, it's all the younger managers striving to get at this level, they have got no chance of getting there," Allardyce, 61, insisted. "If you look across at the rest of Europe and see how many of their own they look after it's quite staggering compared to ourselves. We do not, in any way, shape or form look after our own." In Italy's Serie A, 18 of the 20 teams have Italian coaches, with 14 of the 20 La Liga bosses Spanish and 11 of 18 in the Bundesliga coming from Germany. "Every time a job becomes available nobody goes down to League One," said Allardyce, whose Sunderland team avoided relegation this term after securing 11 points from five matches in the closing stretch. "None of the foreign coaches are trained or equipped any better than we are but unless we get the opportunity to get interviewed, which is rare now, particularly for young managers, a manager getting into the Premier League now that is English or British would have to do it via getting promoted through the Championship. "Everyone is talking about Eddie Howe at the moment and rightly so but the only way he got to the Premier League was via Bournemouth, nobody went and plucked him out. "The challenge of the foreign managers made us better over the years, there is no doubt about that, but the way it is going I can see no English manager in the Premier League and that could be very shortly as well." It is not the first time Allardyce has spoken out about foreign coaches in the English game. In 2012, while in charge of West Ham, he observed that he would never manage a top four side because his surname was not 'Allardici'. Allardyce - anti-Klopp or saviour? Read more on Sam Allardyce: Anti-football or innovative & underrated?